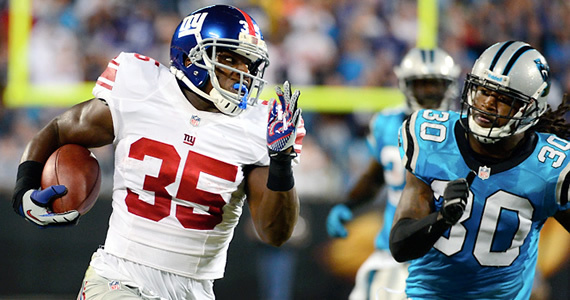 Jobu reviews the Giants dominant win against the Carolina Panthers in week three. Coming into Thursday night’s game, I was a little annoyed. The Giants have only had one Sunday game so far this season. Stop ruining my Sundays, NFL! Anywho, I wasn’t able to watch this whole game because of a work-related Happy Hour (the bar had the game on) and my train ride home, but I did see the first quarter and the fourth, and I like everything that I saw. The Giants defense finally stepped up and the Giants offense continued the roll they started on against the Buccaneers, despite the fact that they were missing Hakeem Nicks and Ahmad Bradshaw, and the Giants won 36-7. You know it’s a good day when David Carr gets involved late, right? This game was all Giants from the very beginning. On their very first possession, Eli marched the Giants down the field and hit Martellus Bennett for 14 yards and his third TD of the season. Bennett has been a very nice addition to this Giants offense, and he seems to be one of Eli’s favorite End Zone targets in the early going. The Giants actually scored on eight of their ten possessions in this one. It was very impressive. Rather than go through each score, I’d like to highlight some guys that really stepped up their games when the team needed them to. Andre Brown is probably my game MVP for this one. The man who had previously been cut seven times by five different teams stepped into Ahmad Bradshaw’s shoes and didn’t skip a beat, running 20 times for 113 yards and 2 TDs. This had a lot to do with the offensive line finally getting their acts together, but Brown was very impressive in his first start. He was also impressive after Bradshaw went out last week too. It looks like the Giants have found themselves a new weapon. The other guy that stepped up huge in this game (literally) is 6’6″ Ramses Barden. The fourth year receiver finally got his chance to shine with Nicks and Domenik Hixon out with injuries, and he really came through. 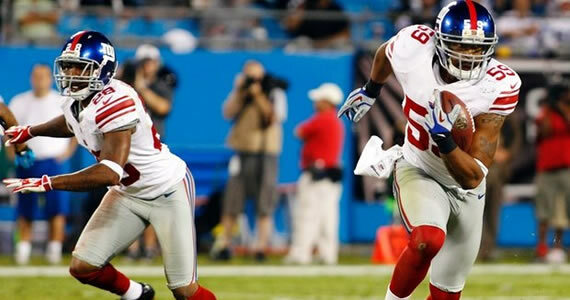 Barden caught 9 passes for 138 yards in the game, which was just what Eli needed him to do. There was a nice moment near the end of the game where Barden walked up behind Eli and gave him a sheepish hug, as if to say “Thank you for giving me the chance to have the game of my life.” It was a tender moment you don’t often see on a football field. Kudos, Ramses. Maybe i’ll stop calling you Javier Bardem now. I should touch upon the game Eli had too. Peyton’s little brother continues to dig his way out of that shadow (as if the two Super Bowls weren’t enough) with his play every week. Against the Panthers, he was almost unstoppable. Eli completed 27 of 35 passes for 288 yards and one score. His passing also helped set up both of Brown’s 1-yard TDs. Another great game for the future Hall of Famer (there, I said it). The defense didn’t really show up in game one. They didn’t really show up in game two. In game three, they finally made it. Coming into this game I was pretty sure we were going to be in for another shootout. I left Steve Smith in my fantasy roster because I thought he might catch 200 passes against the Giants secondary. Although Smith still did his job, the defense shut down one of the more dynamic players in the league in Cam Newton, and held the Panthers to just seven points. It was all about turnovers in this one. The Giants got off to a big lead (20-0 at the half), which led the panthers to pretty much abandon the mostly ineffective running game (they ended with 60 yards on 20 carries), and put the ball basically solely in Cam Newton’s hands. The Giants D ate him up. While Newton did run for the only Panthers TD of the night, the rest wasn’t pretty. The Sophomore went just 16-30 and threw 3 INTs in the game. The Giants pretty much shut him down on the ground too, as he managed only 6 yards on 6 carries in the game. It didn’t help that return man Joe Adams had two very costly punt return fumbles, but this one is on the Giants D and Cam Newton’s inability to solve it.